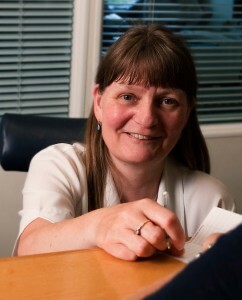 “I really enjoy working in the hub of the clinic” says Julia Curties, a receptionist at Bourn Hall Clinic in Colchester. Julia had been working full-time but when her mother needed extra help something needed to change. Julia originally came to the Colchester clinic, in September 2006, to temp for one day. She impressed senior management so much they asked her to stay on and she became a full-time receptionist in the busy fertility and IVF clinic. Unexpectedly in 2014, Julia’s mum, aged 82, became very ill and was in and out of hospital over several months. Since then she has been house-bound and reliant on help and support from carers and her three children, including Julia. Starting to feel the strain, Julia approached Senior Management in December 2014 to see if she could reduce her days from five to four. “Mum used to be very independent but now is needing more and more done for her, so I do the shopping and help make her tea. I don’t mind this but it can be difficult to find time for myself. It was agreed Julia would reduce her days from five to four. “I now have Thursday off, which has made a huge difference for me. I have a chance to catch up with all my own things as well as Mum’s whilst continuing to enjoy my front-line work. Julia’s efforts and work is appreciated – by staff and patients – and her kindness with patients and her consistent performance has made her a winner in the national ‘Office Professional Awards’. Find out more about our Bourn Hall family here. If you are interested in working at one of our clinics, take a look at our current vacancies here.